Atomic Abbie came to visit Tiverton Academy to show us some MAD science experiments. It was great fun and very MAD! We are looking forward to seeing what happens during the MAD science after school club every Tuesday! Over the summer holiday, children in Year 4 were given the challenge of researching a rainforest animal and its habitat in preparation for our new topic Saving the World. They were given the challenge of creating a project page to show-off their learning. Wow! Just look at the results! What do seeds need to germinate? What happens to celery when you put it in food colouring and leave it? We asked ourselves this question earlier this week. We had a great assembly when Mad Science came in to do a fantastic assembly for the whole school. 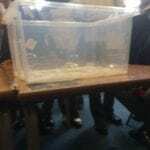 It was such fun science experiments. Some children have now joined the Mad Science Club after school. Watch this space for more information about their progress! Our first lesson on plants and finding out the different parts of a flower. Stay tuned to find out what we do next. This week Year 1 have been testing materials they think would be suitable for a garden apron. We had great fun investigating the properties of materials and were surprised with some of our results. Keep up to date about our investigation into materials right here on our blog! Our visit to the farm. On Wednesday 9th March, Year 3 and 4 had a visit from some very special people! Dentistry students from the University came to teach them all about good oral hygiene, caring for your teeth and gave the children the chance to see what it was like “behind the mask”. This week we have been learning about different types of animals from general house pets to mysterious sea creatures. Using a selection of images and descriptions we were able to classify them into their correct animal groups. See how we got on! ! Can + Fire = WOWWWWWWWW! Year 5 and 6 worked together in groups during their science lesson today. Children travelled between the two classes to work on 8 different stations looking at magnetic field and forces. This afternoon we had some wonderful visitors from StarDome to teach us about constellations. We listened to traditional tales from around the world about how stars formed beautiful constellations. It was an amazing afternoon! What constellations can you see at night? In science we experimented how to make cars move with a balloon, the children were provided the equipment and had limited guidance to how to make their car, they had to experiment and think on heir feet. Unfortunately, we were not successful but had a bundle of fun. Today in science we found put about magnetic forces and materials that attract and repel. In pairs pupils experimented with materials given to test wether they attract or repel when using a magnet. We started to think about the reasons for this and materials being used, was there a link between them all? Year 5 have started science with a bang this term! We have been learning all about forces and magnetism. We launched rockets using vitamin C tablets and water in film canisters: We made balloon powered cars: Watch this space for the next experiment! 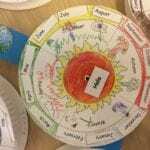 Science: How do we have day and night? What is Science? What is a scientist? To kick start our first science experiment to answer Hala’s amazing question, ‘Why doesn’t the water fall off the planet?’, we explored what science is and what it does in our lives. We learned about key scientists, like Flemming and Bell! 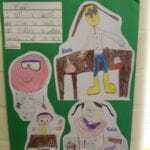 Then we drew pictures of ourselves as scientists. Great lesson today with year 6. We learn’t about Friction and forces taking place during our experiments. Year 3 and 4 came together to do some science experiments about forces. We did the egg and flask experiements, used Magdeburg spheres and the glass and card trick. By the end of the lesson, children were able to identify and explain ‘air pressure’, ‘expansion’ and ‘imbalance’. Watch this space for more crazy science experiements.